The settings for the web connector and front-end web server can be modified here. 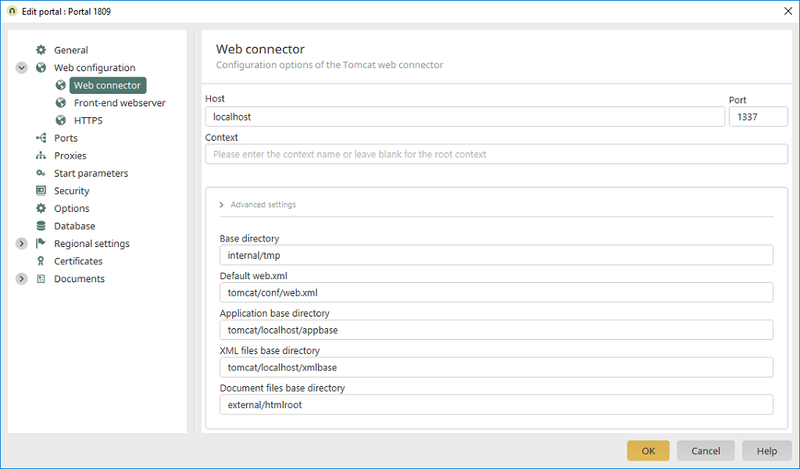 The host and port of the Tomcat web connector have been entered here. Enter the context name or leave the field blank for the root context. By default, the web.xml is in the portal directory tomcat/conf. By default, the application base directory is in the portal directory tomcat/localhost/appbase. By default, the XML files base directory is in the portal directory tomcat/localhost/xmlbase. By default, the document files base directory is in the portal directory external/htmlroot.